While natural disasters have the unique ability to unify people, it is important to stay cognizant of scams and fraud that follow. 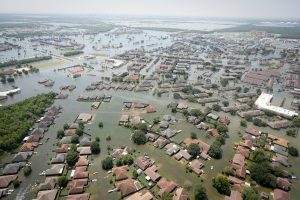 PropertyCasualty360 addressed potential scams in this article, noting that hurricane relief fraudsters are some of the first to appear after a storm. One way to avoid scams is to donate strictly to well-known reputable organizations such as the Red Cross or Direct Relief. The Insurance Industry Charitable Foundation has a Hurricane Harvey disaster relief fund as well. Affected homeowners should be wary of who they let into their home for repairs. Regulators in Florida are warning consumers not to sign Assignment of Benefits (AOB) forms to get repair work started. FEMA has launched this page with information on disaster relief and how affected individuals can prepare for the arising fraudsters. Our Communications department has received questions from Canadian news outlets on behalf of Canadian citizens who own homes in areas affected by either Hurricane Harvey or Irma. Here are some of their questions and the answers we found. Of course, the answers below also apply to other non-citizens who own property in the U.S.
Q: Can Canadians qualify for a Federal Emergency Management Agency (FEMA) grant? A: It depends. To be eligible for assistance from FEMA, at least one person in the household must be a U.S. citizen, Qualified Alien or noncitizen national with a U.S. Social Security number. Q: Can Canadians purchase a FEMA National Flood Insurance Program (NFIP) policy? A: Yes. Anyone who owns property in the U.S. can buy a FEMA NFIP policy as long as their property is in a participating NFIP community. They should be able to buy excess flood coverage if the event they want policy limits above a beyond what FEMA’s NFIP offers ($250,000 for dwelling protection, and $100,000 for the dwelling’s contents). Q: Can Canadians purchase a policy from Florida’s Citizens Property Insurance Corp.? A: Yes, it appears. We found no restrictions on the citizenship of the buyer. To find out more about Florida Citizens’ eligibility requirements click here. One of the many devastations of the floods that accompanied Hurricane Harvey is the destruction of a up to a million vehicles worth as much as $4.9 billion. The National Insurance Crime Bureau (NICB) has issued a news release warning consumers that vehicles flooded by Hurricane Harvey may soon be appearing for sale around the nation. By definition, a flood vehicle has been completely or partially submerged in water to the extent that its body, engine, transmission or other mechanical component parts have been damaged. If the vehicle is so damaged that it is no longer operable, the driver’s insurance company settles the claim by buying the vehicle and selling it as a “salvage” at an auto auction. Dishonest and unscrupulous car dealers buy the vehicles, dry and clean them, yet leave plenty of hidden flood damage. They then transport the vehicles to states unaffected by the storm or natural disaster and sell them as used vehicles to unsuspecting buyers. These dishonest dealers will not disclose the damage on the vehicle’s title as they are required, which is a crime called “title washing.” The vehicles are then sold with the hidden damage. More facts about flooded cars can he found here. The NICB’s VINCheck is a free public service that allows car buyers to see whether a vehicle has ever been declared as “salvage” or a total loss by an NICB member that participates in the program. Historical Perspective: How Does 2017 Atlantic Hurricane Season Compare to Most Active Past Seasons? Phil Klotzbach, lead author of the Colorado State University (CSU) hurricane forecasting team, and I.I.I. non-resident scholar delivers this perspective. After a relatively mild start, the 2017 Atlantic hurricane season has become drastically more active over the past couple of weeks. Hurricane Harvey made landfall in Texas as a Category 4 hurricane, bringing devastating rains to the Houston metropolitan area, causing at least 70 fatalities and economic losses estimated as high as $108 billion. Following hot on its heels, Hurricane Irma developed off of Cabo Verde and has intensified into a devastating Category 5 hurricane. Irma has wreaked death and devastation across the northern Leeward Islands, and after brushing the northern coast of by Puerto Rico, the cyclone is tracking across the Turks and Caicos, the Bahamas, and appears headed toward Florida and the southeast United States. While landfall of a major (Category 3+ on the Saffir-Simpson Wind Scale – maximum sustained winds of 111 mph or greater) hurricane in the United States seems likely at this point, it is important to realize that other years in the recent past brought major storms in rapid succession. 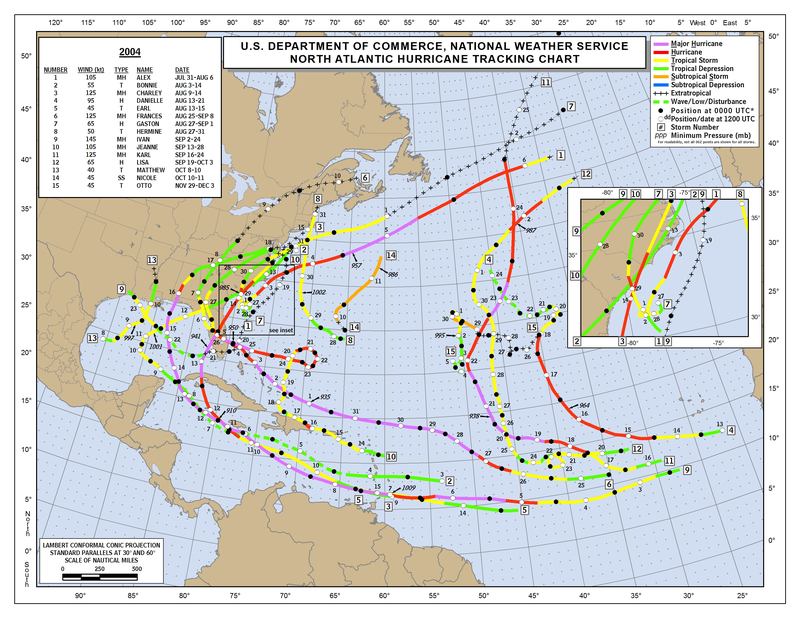 During the 2004 Atlantic hurricane season, a total of five hurricanes made landfall (Charley, Frances, Gaston, Ivan and Jeanne), with four significantly impacting the state of Florida. Prior to Harvey’s landfall, Charley was the last Category 4 hurricane to make landfall, doing so in SW Florida. Both Frances and Jeanne made landfall near Stuart, FL as a Category 2 and Category 3 hurricane, respectively. Ivan made landfall near Mobile, AL and brought significant storm surge and wind damage to both Alabama and the Florida Peninsula. Total economic losses from that year are estimated at $71 billion. 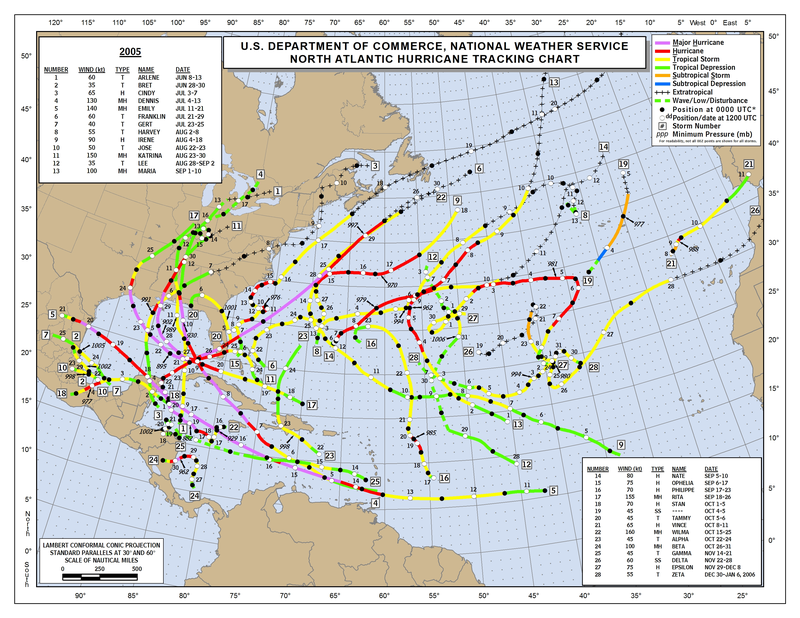 Hot on the heels of the 2004 season, the 2005 Atlantic hurricane season had the most named storms (28) and hurricanes (15) on record. It also had five landfalling hurricanes, including four major landfalling hurricanes (Dennis, Katrina, Rita, and Wilma). Dennis made landfall on the Florida panhandle causing considerable damage there, while Katrina was a large Category 3 hurricane that caused intensive surge and wind-related destruction along the Mississippi coastline as well as triggering the levee failure that caused massive flooding in New Orleans. More than 1,500 fatalities occurred in Katrina. Rita made landfall several weeks later in SW Louisiana, also causing significant surge and wind-related damage. Then Wilma rounded out the season, becoming the strongest storm on record in the Atlantic (as measured by central pressure); making landfall as a Category 3 hurricane in SW Florida. All told, the season caused $208 billion in damage. While the 2017 Atlantic hurricane season has been devastating already, and continued destruction with Irma looks likely, the two recent years of 2004 and 2005 were also incredibly deadly and destructive. The United States has enjoyed a great string of luck since 2005, with NO major (Category 3 or greater) hurricane landfalls. Harvey, of course, brought that streak to an end. Unfortunately, it looks like we may have another very significant United States landfall hot on Harvey’s heels. Hurricane Irma begins its assault, while Texas and Louisiana begin the long road to recovery from Hurricane Harvey. No one, of course, knows exactly what damage Irma will unleash, but it is likely to be quite different from what Harvey wrought. That’s because no two storms are alike. While Harvey’s record rains drenched southeastern Texas and western Louisiana, flooding Houston in over 4 feet of rainfall, Irma’s winds — if they stay as strong as they were on Tuesday evening — could flatten buildings, trees, and power lines on the Caribbean islands it’s threatening to devour. At its peak, Harvey was a Category 4 hurricane on the Saffir-Simpson scale, but its weakened winds downgraded it to a tropical storm the day after it made landfall. Irma, meanwhile, is a Category 5 monster that’s already one of the strongest Atlantic hurricanes ever recorded — and it’s still strengthening. Meanwhile, Live Science laments the problems with shoehorning all the complexities of a hurricane into a single number, like Category 5. As a Category 4 storm, Harvey’s winds meaning landfall blew between 130 and 156 mph. 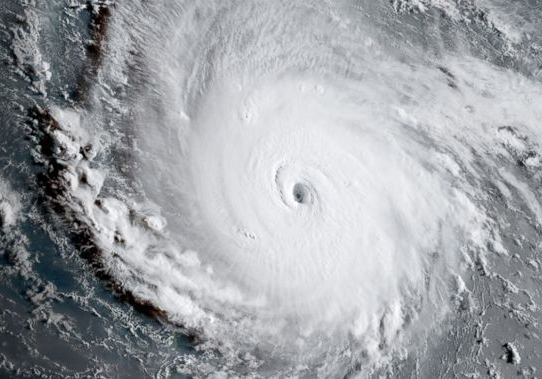 But catastrophe modeling firm RMS said the storm packed only one-fifth the total energy of Hurricane Ike, a Category 2 storm that struck the same area in 2008. Harvey became an enormous flood because the storm lost almost all its forward momentum upon reaching land. Meanwhile Irma is among the most powerful storms ever to cross the Atlantic, but doesn’t threaten a Harvey-like deluge. It is delivering, however, bark-shredding winds that will cause catastrophic damage. Both storms, though, are tragedies. Harvey survivors can learn more about filing flood insurance claims here. They can learn about filing other insurance claims here. For other types of federal disaster assistance, click here. If you are bracing yourself for Irma, FEMA has advice here. FEMA encourages ALL individuals affected by Hurricane Harvey to register for disaster assistance—even if they have flood insurance. At this time, FEMA is encouraging individuals to register through the website at: www.disasterassistance.gov. There is the ability to register by phone however; as expected there will be wait time when calling 1-800-631-6632 (FEMA). · Disaster-caused medical and dental expenses. · Disaster-caused funeral and burial expenses. · Disaster-caused damages to essential household items (room furnishings, appliances); clothing; tools (specialized or protective clothing and equipment) required for your job; necessary educational materials (computers, school books, supplies). · Fuel for the primary heat source (heating oil, gas). · Clean-up items (wet/dry vacuum, dehumidifier). · Disaster-caused damage to an essential vehicle. · Moving and storage expenses caused by the disaster (moving and storage of personal property while repairs are being made to the primary residence, and returning property to the primary address). · Other necessary expenses or serious needs as determined by FEMA. · Other expenses that are authorized by law. · At time of registration and inspection, applicants are required to inform FEMA of all insurance coverage that may be available to them to meet their disaster-caused needs. FEMA does not require denial of insurance coverage before people call 800-621-3362 to register for FEMA assistance. · Applicants who only have homeowners insurance but have sustained flood damage are not required to submit insurance documentation to receive FEMA Rental Assistance or financial assistance for real or personal property disaster-caused damage. · Applicants are not required to submit homeowners-insurance documents to FEMA before FEMA will consider their eligibility for financial assistance for any real property damage caused by flood. For more information on FEMA’s Individual Disaster Assistance, please see https://www.fema.gov/individual-disaster-assistance. In addition to settling insurance claims the insurance industry is also strongly committed to raising charitable funds for victims of recent hurricanes. The IICF announced the establishment of a new disaster relief fund to assist those affected by the catastrophic damage of Hurricane Irma. To donate to the IICF Hurricane Irma Relief Find click here. The IICF also announced today that the insurance industry has already donated millions of dollars in relief. The figure is believed to already exceed $15 million, industry-wide. To date, the IICF’s Hurricane Harvey Disaster Relief Fund has raised more than $400,000 to help the affected communities – through both company contributions and individual donations from 1,000 insurance professionals. Allstate and The Allstate Foundation will commit $3 million to assist people affected by Hurricanes Harvey and Irma, as well as potential future disasters, doubling its initial pledge of $1.5 million. NFIP insured losses – between $6 billion and $9 billion. This implies losses will hit the private reinsurance layer ($4 billion excess $4 billion, of which reinsurers bear about 26 percent). Private flood insurance losses: less than $0.5 billion. Uninsured flood loss: between $18 billion and $27 billion. Insured wind loss: $1 billion to $2 billion. Insured loss for Texas and Louisiana is between $7.5 billon and $11.5 billion, according to their estimates. This excludes commercial, loss of business and other, broader economic losses, according to the CoreLogic press release. An estimated 70 percent of flood damage from Hurricane Harvey is not covered by any insurance. Media accounts after catastrophes discuss two types of losses – economic losses and insured losses. Sometimes they do not distinguish between the two. Insured losses are the claim dollars that insurance companies incur from a disaster. Economic losses are the total losses, some of which is covered by insurance and some of which is not. Another way to say it: insured loss + uninsured loss = economic loss. A hurricane creates another complication. Hurricanes often involve flooding, but flood losses are not covered by a standard homeowners policy. They are covered by a special insurance policy with the federal National Flood Insurance Program. Often insured loss estimates leave out losses from flood insurance. Here is a rundown of loss estimates, both insured and uninsured. We’ve tried to specify whether flood is included, or if there is another important nuance to the estimate. We will keep updating estimates as we receive them. 9/6: AIR estimates property losses from wind, flood and storm surge to be $65 billion to $75 billion. Insured losses will be about $13 billion, detailed in the “Insured Losses” section of this post. Global risk modeling and analytics firm Risk Management Solutions (RMS) projects economic losses caused by wind, storm surge, and inland flood from the calamity to be as high as $70 billion to $90 billion. The majority of the overall loss is likely to be from inland flooding in the Houston metropolitan area, RMS said. Update 9/4: RMS puts the NFIP-insured tab at between $7 billion and $10 billion, implying a significant if not total loss to its private market reinsurers, who reinsured a little over $1 billion of the $4 billion excess $4 billion layer. Update 9/1: Moody’s Analytics estimates economic losses to be between $81 billion and $108 billion, Artemis reported. Moody’s Analytics estimates economic losses in southeast Texas alone to be between $51 billion and $75 billion, Artemis reported. Moody’s Analytics expects property damage to homes and vehicles of $30 billion to $40 billion, $10 billion to $15 billion in flood damages to businesses, $5 billion to $10 billion in infrastructure damage, and $6 billion to $10 billion of lost output. This estimate excludes NFIP losses. 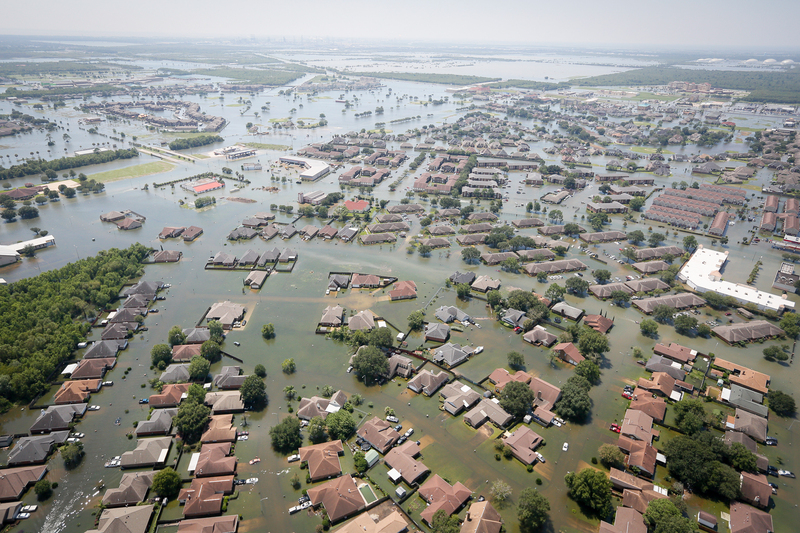 Catastrophe modeling firm AIR Worldwide, A Verisk Analytics business, estimates that privately insured losses resulting from Hurricane Harvey’s winds and storm surge in Texas will range from $1.2 billion to $2.3 billion. Business Insurance notes that S&P puts a $6 billion industry loss on the event, with primary companies, not reinsurers bearing the brunt. The article also discusses the possibility of flood vs. wind coverage disputes, which were a notable issue after Hurricane Katrina and superstorm Sandy. Insured loss for Texas and Louisiana is between $7.5 billion and $11.5 billion, according to their estimates. This excludes commercial, loss of business and other, broader economic losses, according to the CoreLogic press release. Analytics firm Corelogic estimates privately insured losses from wind damage to range from $1.5 billion to $3 billion.